India suffered a shocking batting collapse at Sydney, losing 4 for 3 and thus losing the first ODI in spite of a stupendous 133 by Rohit Sharma. India pacer Bhuvneshwar Kumar however termed the collapse a one-off. 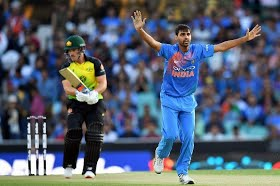 “It was one of those matches where the top order didn’t click,” paceman Bhuvneshwar Kumar told reporters in Adelaide, according to a Fox Sports report. “It can happen with you when you play so much cricket. So it was just one of those things, it’s very rare for us,” he added. Kumar also went on to say they still believe they can emerge victorious in the series. We have been in this situation before,” he said. “We know it won’t be impossible to win the series but it won’t be easy for us as we are playing away from home. We are preparing in a manner where we have to win our next two matches so it’s a kind of knockout for us, we can’t afford to lose this match,” the Indian bowler admitted.